My name is Amanda MacGillivray and I had a beautiful home birth in a pool with my son almost 3 years ago. I am very grateful that a movement like yours exists because it's my firm belief that if society had access to pictures and videos of birth in all of the ways it happens, they would feel more confident when it's their turn that it's not a one size fits all experience. As a first time mother who chose to have a home birth early on in my pregnancy, I received a lot of support, but I knew it wasn't full. There was a lot of underlying fear and doubt that I couldn't "handle" it. I chose to not let it into my space and believe that my son and I could do this together. I had all of these ideas of how I wanted my birth to go. I basically wanted a ton of friends and family there, music, candles and to be continuously massaged and talked to by my husband. My son had other ideas. It was all me and him, and when my labor started I didn't want to be touched at all and I didn't want people around. I was in a deep trance the whole time and it was the most connected I've ever felt to another person and I feel he was in control more than me. In fact, throughout my entire labor I got very distinct visions of him getting into a spaceship on another planet and preparing for "take off". He was so confident putting his helmet on and pressing buttons telling me he would be there soon and I felt I already knew what he looked like. Far off in the vision I could see earth which was his destination. From the time I started having my first contractions to the time I watched him push his own body out of mine in the birthing pool it had only been 4 hours almost on the dot. I had very little pain throughout and when my midwife checked me to tell me I was 10cm dilated and could push at any time, my pain had already dissipated completely and I had thought my labor process stopped entirely and would have to start over! I made the effort to push which didn't hurt at all, and when his head pushed out all time stopped and his beautiful head just suspended in the water and his hair flowed back and forth and I knew it was all real. After who knows how long I felt his little shoulders shimmying, I barely gave a push and he slipped out like a bar of soap. In fact I don't even remember if there was a last push. I just remember feeling his shoulders and as if he was doing the pushing. Then he was out and my husband had the honor of touching him first and placing him on my chest right away. It was my choice to believe that my own birth could be different. That I could defy my own and other people's fears and also to treat my growing son like he was already a man and had a say in his own birth as well. I chose to let go of my ego and expectation of a pleasurable, painful, short, long, complicated, easy etc. etc. birth because whichever adjectives would come to fit my experience would happen no matter what and I would still learn. I was blessed with what I consider to be an ideal birth being short and very little pain in my own home with my closest family members around, but I plan to remain without expectation the next time around as well. Just because I had this experience happen this time doesn't mean it will happen next time. It's most important to honor the process, acknowledge your child as an individual and not let your or other's fear guide you. 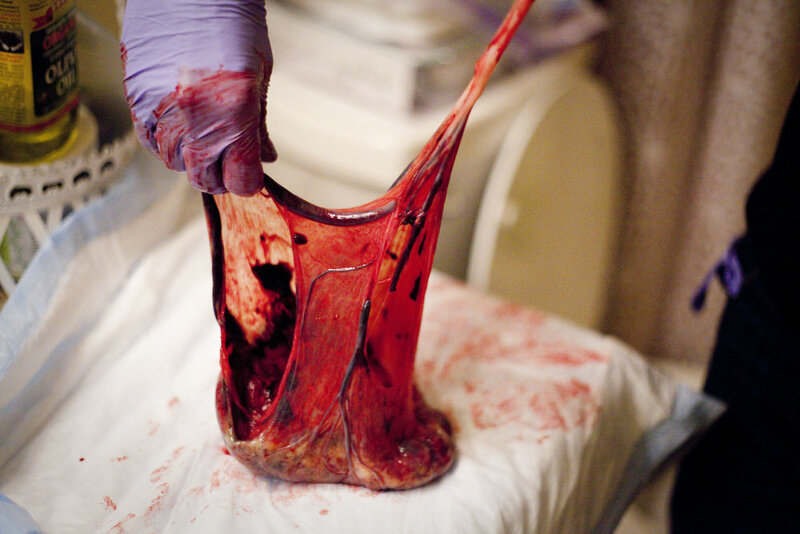 Interestingly, after the birth of my son my placenta wouldn't come out. It took a couple of hours and after trying light tugging, a small dose of Pitocin, and pushing, nothing would get it out except a birthing stool. To my midwife and midwife assistant's amazement my placenta was a velamentous cord insertion and they even gasped when they saw it as if it were an urban legend. Apparently it's a very rare abnormality that is potentially dangerous because a sack forms around the placenta and blood vessels grow into the membrane. When the baby is being born it can potentially burst through the membrane, break some blood vessels and therefore cut off the oxygen supply. It didn't happen to me, but my midwife got a cool picture of it! To submit your story to the blog, email content to empoweredbirthproject@gmail.com with "submission" in subject line. If you want your Facebook and/or Instagram handle linked in the post, please include them as well (it's also perfectly okay to submit anonymously). Photos, videos, or links that provide readers with more information about you or your experiences are also welcome!